Backbone - A backbone is a major network connection that provides the main pathway through a network, much like an interstate highway does. When referring to the Internet Backbone, we are talking about a number of high speed fiber optic connections that connect major networks together. Bandwidth - The term bandwidth refers to the amount of data that a given network connection can transmit. One can think of this like the size of a plumbing pipe - the wider the pipe, the more water can be carried at a time. As an example, 10base-T has a bandwidth of 10mbps. Binary - Refers to the ‘language’ computers speak. Binary code (or machine language) consists only of zeroes and ones (ie a choice is either on or off), called bits. Letters and other information have a specific binary representation made up of up to 8 bits (one byte). BIND (Berkeley Internet Name Domain) - Previously known as Berkeley Internet Name Daemon, BIND is the most widely used DNS server on Linux and Unix systems. For this reason, it is the most widely used DNS server on the internet. BIND was developed by the University of California Berkeley. BIOS - BIOS stands for Basic Input/Output System and is software that manages hardware and allows the operating system to talk to the various components. 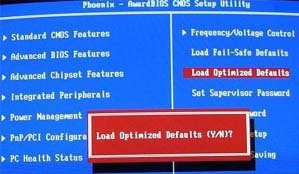 The BIOS is also responsible for allowing you to control your computer's hardware settings, for booting up the machine when you turn on the power or hit the reset button and various other system functions. The BIOS software lives on a ROM IC on the motherboard known as a Complementary Metal Oxide Semiconductor(CMOS). People often incorrectly refer to the BIOS setup utility as CMOS, however, CMOS is the name of the physical location that the BIOS settings are stored in. The term BIOS is typically used to refer to the system BIOS, however, various other components such as video adapters and hard drives can have their own BIOSes hardwired to them. BIT - A binary digit which is the smallest piece of information that a computer can hold. A bit is always one of two values, written as 1 or 0, corresponding to the on or off state of a digital switch or the high or low of electrical impulses. Single characters of information are represented by a combination of bits called bytes. For personal computers, a byte equals eight bits. BMP - Bitmap files are the default bitmapped images used in on Windows operating systems and are a Microsoft proprietary file format. The Windows "Paint" program is designed to work with BMP files. BMP files can support up to 16.7M colors. The BMP format supports RGB, indexed-colour, greyscale, and bitmap color modes. BNC (Bayonet Neill Concelman) - Sometimes incorrectly referred to as a "British Naval Connector", this connector named after its inventor has found uses with both broadcast television equipment and computer networks. Nowadays, it is most commonly seen as the connector found on coaxial cable used in homes. With regards to networking, this connector was used on early 10Base-2 (Thinnet) Ethernet networks. It has a center pin connected to the center cable conductor and a metal tube connected to the outer cable shield. A rotating ring outside the tube locks the cable to the female connector. Bootcamps - A certification bootcamp is a training school offering an intesive program whereby candidates can prepare for certification exams in short amounts of time. Typically, the candidate will travel away from home and stay at the training facility or in a hotel nearby. The length of the camps can vary from a few days to a couple of weeks. Criticisms of bootcamps include the fact that they promote memorization rather than learning, are very expensive, and often use illegal training materials such as braindumps and real exam questions. Transparent - Only one bridge is used. Broadcast – traffic sent out from a network node that will reach every other node on the subnet / broadcast domain because the message is sent with the intent of reaching all nodes. The network node that is sending the traffic will use the broadcast address for that subnet and every device in that broadcast domain will receive the broadcast information. Generally the broadcast address is the last IP address of that segment. As an example, in the IP address range of 192.168.0.0 this broadcast address would be 192.168.255.255 and the traffic would reach all available nodes on the subnet. Additionally 255.255.255.255 could be used which is the broadcast address of the zero network (0.0.0.0). Internet Protocol standards outline that the zero network stands for the local network so only those node on the local network would hear the broadcast traffic across the 255.255.255.255 address. BTX - A standard proposed by Intel, the BTX form factor provides better airflow and cooling, specifically the thermal unit which blows hot air from the CPU directly out of the case. At this time, it is unknown if this form factor will become the standard replacing the ATX form factor, however, it is being used on many new computers. Bus - A collection of wires through which data is transmitted from one part of a computer to another. You can think of a bus as a highway on which data travels within a computer. There are busses both within the CPU and connecting it to external memory and peripheral devices. The bus width (ie, the number of parallel connectors) is one factor limiting a computer's performance. Byte - A byte is a series of 8 bits used as a unit of storage measurement in computers. Large amounts of memory are indicated in terms of kilobytes (1,024 bytes), megabytes (1,048,576 bytes), and gigabytes (1,073,741,824 bytes). Byte Converter.